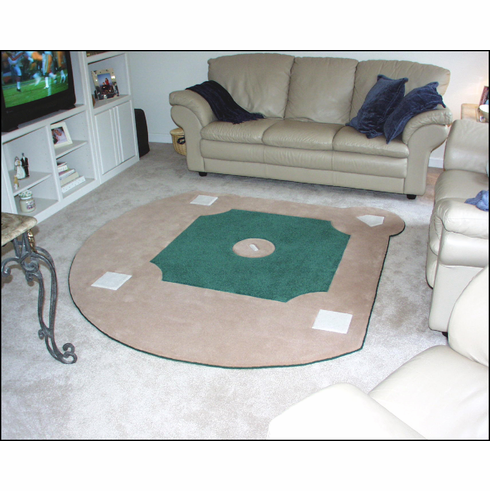 Complete any baseball room or child's room with one of these custom baseball field rugs. Luxurious pencil point carpet makes these high-quality rugs a must-have for true baseball enthusiasts. Three shades of carpet (Green is Valeur Award, Beige is Valeur Resort) are used to create the baseball diamond...green trim binding surrounds the entire rug. All carpet carries a 10-year wear guarantee and a 5-year fiber retention guarantee. Due to the high-quality of the carpet, we recommend annual professional cleanings and vacuuming frequently between cleanings. 4' x 4' baseball field rugs are $900 plus shipping. 8' x 8' baseball field rugs are $1,900 plus shipping. Please call us with any questions you may have or if you need additional pieces and/or matching runners added to your order! Gift wrapping not available - please allow 2-3 weeks for shipping.